The Port Royal Experiment, the first major attempt by Northerners to reconstruct the Southern political and economic system, began only seven months after the firing on Fort Sumter. On November 7, 1861 the Union Army occupied South Carolina’s Sea Islands, freeing approximately 10,000 slaves. 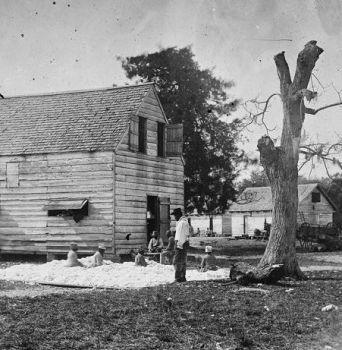 As the Confederate Army and white plantation owners fled, Northerners began to capitalize on their possession of an area world famous for its cotton. During the first year of occupation African American field hands harvested approximately 90,000 lbs. of the crop. The workers were paid $1 for every 400 pounds harvested and thus were the first former slaves freed by Union forces to earn wages for their labor. In January of 1862 Union General Thomas W. Sherman requested teachers from the North to train the ex-slaves. Three months later U.S. Secretary of Treasury Salmon Chase appointed Boston, Massachusetts attorney Edward L. Pierce to begin the Port Royal Experiment, which would create schools and hospitals for ex-slaves and to allow them to buy and run plantations. That same month the steamship Atlantic left New York City, New York bound for Port Royal. On board were 53 missionaries including skilled teachers, ministers and doctors who had volunteered to help promote this experiment. In April The Port Royal Relief Committee of Philadelphia, Pennsylvania dispatched Laura Matilda Towne with funds to found the Penn School, one of the largest of the missionary schools created during the Port Royal Experiment. In 1863 President Abraham Lincoln issued new land redistribution policies that allowed nearly 40,000 acres of abandoned Confederate plantations to be divided among 16,000 families of the “African race.” The freed people were to purchase the land at $1.25 per acre. Almost immediately local blacks bought about 2,000 acres of land. White Northerners also purchased land. Edward Philbrick, for example, bought 11 plantations that collectively covered 7,000 acres. His holdings supported 950 African Americans as tenant farmers. Union General Ormsby Mitchel granted African American islanders permission to found the town of Mitchelville on Hilton Head Island, the first of many all-black communities. By 1865 Mitchelville had 1,500 inhabitants. As the Union moved closer to victory however, enthusiasm for the Port Royal Experiment began to wane. Many Northern whites, initially concerned about compensating African Americans for the injustices they had endured during slavery, now saw voting rights rather than land ownership as the key component to black progress. More conservative Northerners were increasingly uneasy about the precedent set by large scale land confiscation. It was the death of President Abraham Lincoln in April 1865, however, that ended momentum for the experiment. The new president, Andrew Johnson, was determined to restore all lands back to their previous white owners. In the summer of 1865 he ordered Brigadier General Rufus Saxton to begin that process. Nonetheless not all white owners returned to the Sea Islands, and thousands of black landowners and their descendants continued to farm their lands until well into the 20th century. Akiko Ochiai, "The Port Royal Experiment Revisited: Northern Visions of Reconstruction and the Land Question," The New England Quarterly 74.1 (2001): 94-117; Willie Lee Rose, Rehearsal for Reconstruction: The Port Royal Experiment (Indianapolis: Bobbs-Merrill, 1964). Royal Experiment (Indianapolis: Bobbs-Merrill, 1964).